The Library Ballroom is the perfect place to host your next event, be it a wedding, reception, anniversary party, corporate or private party, a conference, seminar, concert or show. The venue lends it's beauty to all functions! Join us on Friday, June 7th, for a very special "unplugged" show with Macon's own Choir of Babble, Hindsight, and Felt Lined Coffin. These bands are known to rock out, but this time around they'll be playing some of your favorite covers and originals in an acoustic, stripped-down setting. Come enjoy these bands in a new light! 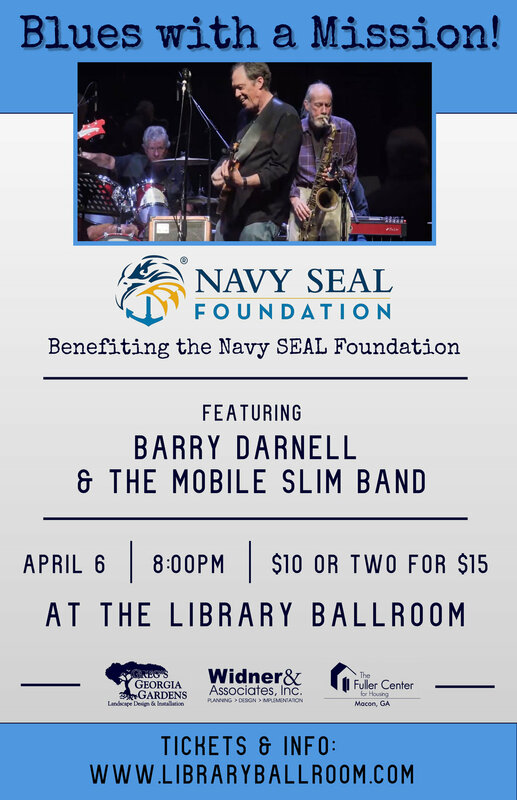 The Library Ballroom is excited to welcome back Barry Darnell & the Mobile Slim for a special benefit concert. The band will be playing the best Blues, Soul, Funk, and Rock-n-Roll. All ticket sales will benefit the Navy SEAL Foundation. Celebrate Mardi Gras with the World Famous Walnut Street Dixie, Racing & Marching Society Jazz Band at Library Ballroom on Saturday, March 2, 2019! Celebrate Valentine's Day with your sweetie while dancing your heart out! We welcome A2Z Band back to The Library Ballroom for a fantastic night of entertainment and fun. Tickets will sell out for this event. Get you tickets now! Fame-bound singer and songwriter Maggie Renfroe will be in concert at The Library Ballroom, Saturday, January 26th, 2019! Proceeds will benefit the Fuller Center for Housing of Macon to help renovate derelict houses. Won't you join us for a great cause! All ticket sales will benefit The Fuller Center for Housing of Macon, Georgia! The Fuller Center for Housing of Macon is a local partner of the Fuller Center for Housing, an affordable housing nonprofit working in 60 U.S. cities and 17 nations throughout the world. The Macon organization works to repair and rehabilitate owner-occupied homes for families who, due to economic circumstances, cannot otherwise afford a simple, decent and affordable home. Thank you to these generous sponsors for making this event a possibility! Their gifts will insure help for a needy family. Maggie Renfroe is an 19 year old singer-songwriter from Macon, Georgia currently attending Belmont University in Nashville, Tennessee. She has a soulful sound with a modern twist. She’s a free spirit with an authentic connection to her audience. Interested in singing and guitar playing from the age of 7, Maggie is making her dream of a music career a reality. For several years Maggie trained under “Mama Jan” at Jan Smith Studios in Atlanta, Georgia before making her debut on the national stage with Season 11 of The Voice. She has two EP albums available, How Did I Get Here and Girl Code – now available on iTunes and Spotify. Performing throughout the Southeast, Maggie has had the pleasure of opening for Jason Aldean, Scotty McCreery, Randell Bramlett, Bear Rinehart from Need to Breathe, and David Cook. Maggie is currently working on new songs and enjoys performing around Nashville. The Library Ballroom is excited to welcome back the Randall Bramblett Band on December 8th! Let’s kick off the best time of year with one of our favorite musicians! Thank you to our sponsors for making this show possible! The Library Ballroom is excited to welcome back the multi-talented Barry Darnell and the Mobile Slim! This time to celebrate the main-man's Birthday! Come on down and hear some awesome tunes and celebrate Barry's birthday with us on September 8th! Thank you to our sponsors! Widner & Associates, Inc., The Fuller Center for Housing, Macon, GA, and Greg's Georgia Gardens. Join the Macon Shag Club on July 7th for a night of dancing! The Atlanta-based Gold Standard Band will be rockin' the night away and this event is open to the public! $30 per person or $250 for a table of 10. Tables are limited. The Library Ballroom is excited to welcome RADAR and the Glenn Phillips Band on June 16th! Both authentic, classic rock groups were formed in Atlanta in the late 1960's and they're still jamming the same classic rock hits today! If you're a fan of Yardbirds, Cream, Byrds, Hollies, Hendrix, Stones, Beatles and the like then don't miss this show! The Library Ballroom is excited to welcome back the multi-talented Barry Darnell and the Mobile Slim! They'll be playing the best Blues, Soul, Funk, and Rock-n-Roll in our beautiful ballroom on Saturday, May 26th! Don't miss it! Powered by Squarespace. Home background image by The Photography of Haley Sheffield.